Contents: It's pasta (spinach tagliatelle) with tomato sauce and olives, wholegrain bread, salad, vegetables, fruit salad and vanilla ice cream. Notes: Yes, universities are schools. 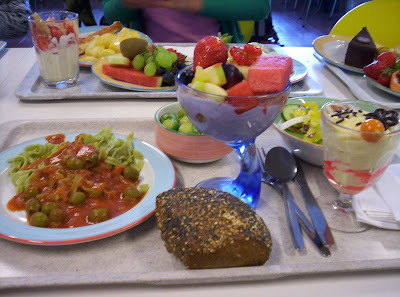 In my own experience, food at universities is much, much better than at schools for younger children. But, it is also usually a lot more expensive. hahaha that's funny cause one look at that lunch and all I said was WOW!!! I live in Germany and the problem is: the picture looks good but the daily meal is bad. Wow! I am a horribly picky eater but I love everything on that plate. Spinach pasta with tomato sauce with olives would be an amazing lunch! I live in Germany (born & raised). Some university cafeterias offer really good lunches, others (like mine) really bad and cheap food. You can get fruit salads and other desserts, and there is a salad bar, but that will easily add up money-wise. In elementary/high school lunches are not usually provided cause school ended at 1 pm for the longest time. Kids brought snacks and a "second breakfast" but went home for lunch. These days there are more all day schools, but we're still very much in the transition phase. ok guys, first of all this is a university lunch, that means you can pick what you want and this girl picked really good (specially for the desserts), but of course you have to pay more. I've been living in Germany for a year (actually I've also eaten at that university once) and a lot of times the main menu is "french fries" or "currywurst" (french fries with sausage).